Believe it or not, it was not the knowledge of rocks that led to the discovery of the core claims of the Molly Marie Prospect; it was a map. A stone map. About 13 years ago, a mining claim was filed on a virgin barren quartz outcrop just north of First Water Road. This was done as something to strike off the “bucket list”. Little was known of the geology of the area, but it seemed very strange that a significant quartz outcrop in the area, barren or not, would be untouched. John Wilburn’s pamphlet, “Goldfield Mining District Geology and Ore Deposits” was a great start towards learning the geology. 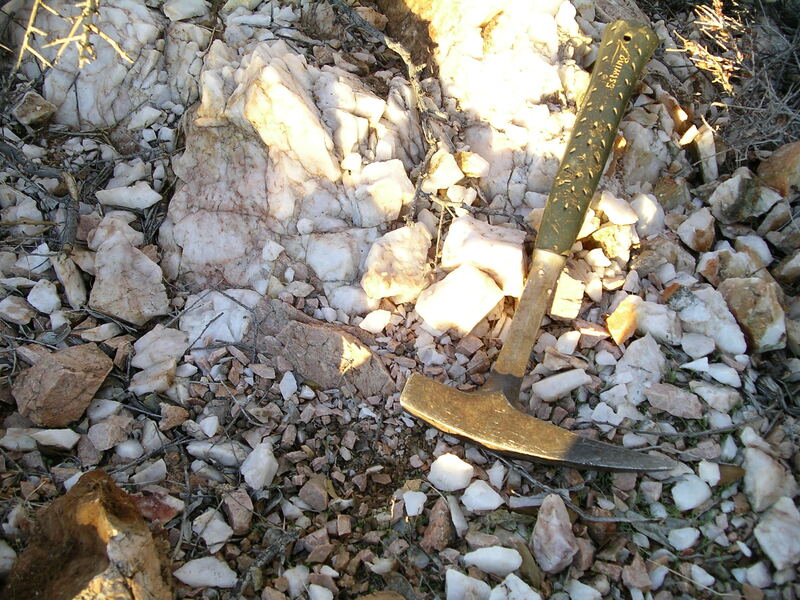 More mineralized ground was discovered and a few more claims were staked, on a hunch. All of the claims were partially staked on breccias, but at the time, the breccias were not even recognized. Then, on an uneventful day north of the claims, on un-staked ground, a peculiar arrangement was recognized…………. A paper copy of the Trail Stone was brought to the same vantage point, and the concept became a reality. The map appears to be pointing to an area that was 2 short ridges, and on one of them was the vantage point. The 2 short lines on the trail stone inside of the “blessed area” (marked with the sideways cross) correspond to 2 short ridges on the ground. All disturbed areas that tested positive seismically later on are on these 2 ridges of breccia. 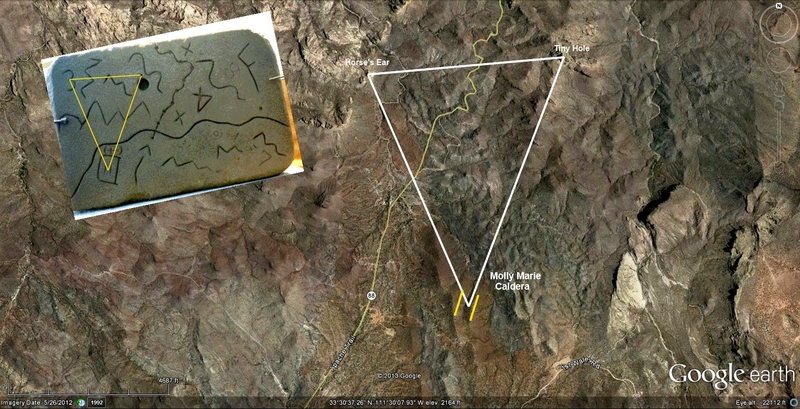 The “F” shape to the east corresponds to the distinctive cliffs of Hackberry Spring that can be seen from Google Earth. Another interesting feature is that the trail stone was made according to the magnetic north present in 1848, not true north, hence rotation is necessary to match the Google Earth photo. 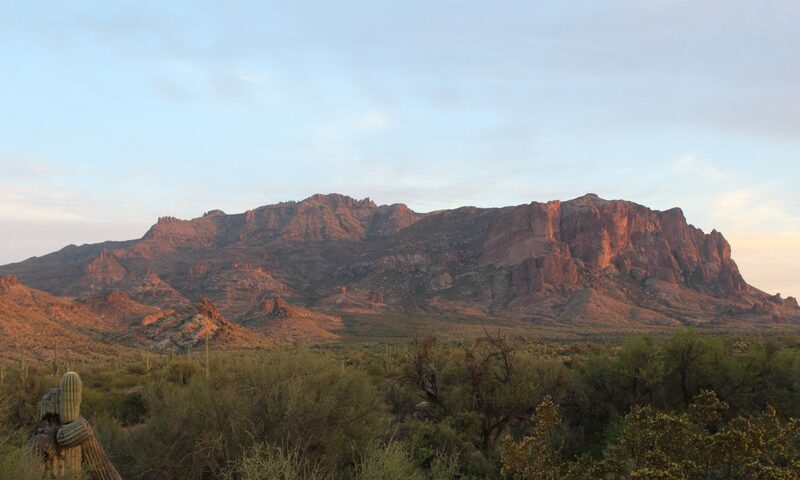 The Trail map shows the outline of Superstition Mountain looking north, and it tells the user not only to look for a hole in the rock on the north side of the mountain, but to look for a tiny hole. The large hole in the map shouts out the great importance of finding the hole in the rock (or mountain). The tiny hole in the stone next to the large one is the precise locating point. The “3” signifies the horse’s head, and the point on the 3 is the precise locating point. The purpose of the stone map was likely to be used as a pattern to trace out paper maps as needed. After the match of the Google Earth photo and the Trail Stone map was known, the remaining portions of the 2 ridges were staked with more mining claims, and even more without knowing much at all about the geology. It was reasoned that it was statistically impossible to have the 3 prominent physical features match the Trail Stone map by coincidence. The breccia was still not recognized, and the process of learning the geology occurred during the years afterwards in bits and pieces. The seismic work of the 2 ridges was done in 2 sessions in later years. The Heart Stone map was another piece of the Peralta Stone maps puzzle. Shortly after learning the significance of the Trail stone, the east-facing cliff behind Government Well revealed itself…as a huge heart. The mountain was scaled (from the north side), and a paper copy of the trail map was brought along. 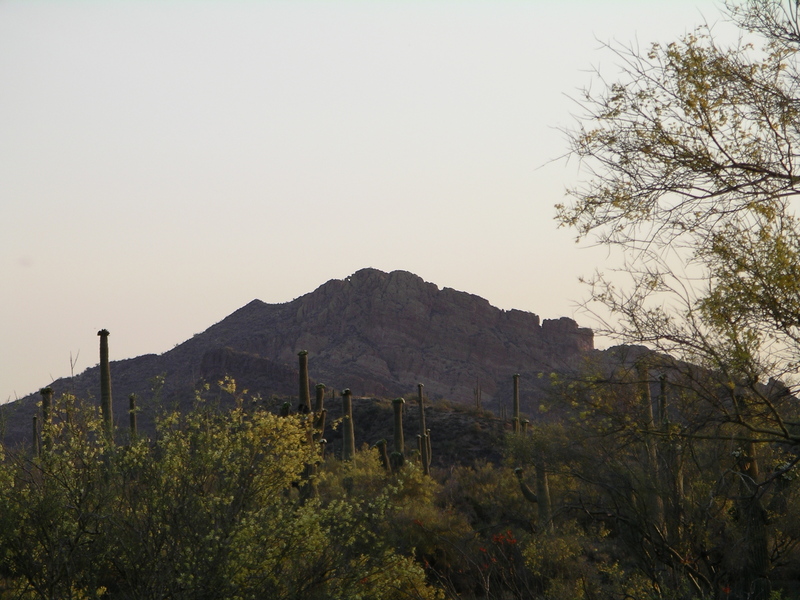 Here is a photo from the top of the Mountain looking towards El Sombrero. The parking lot below is for the Needle Overlook. The short ridges can be partially seen on the far right of the photo. The paper copy of the Heart Stone was positioned on the edge of the cliff in the trough of the heart. 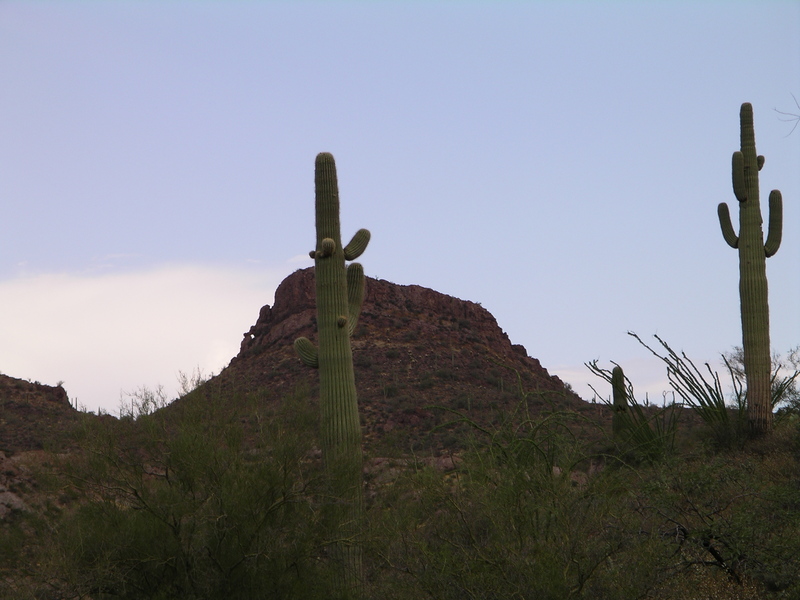 The holes in the rock (the tiny hole and the one above) lined up perfectly with the ones on the map, and El Sombrero (Weaver’s Needle) was precisely aligned with the pointed symbol on the bottom of the heart stone. It was a strange feeling to be standing on the top of that cliff where others had stood 165 years before. It was not imagined then that further research would reveal that the area indicated on the Trail Stone map was a great gold deposit. One of the unsolved mysteries of the Stone Trail Map is the symbol that surrounds the 2 short lines that represent the ridges. For years, this puzzle has been thought of occasionally. Finally, it was realized that it symbolizes a filled in pit, and that you had to empty it to find the treasure inside. Below is a clip of what the symbol looks like filled and set upright, , and what it looks like tipped on the map. This matches what has been learned about the ridges by seismic testing; there are many pits that have been filled in, and the alteration of the surrounding rock (black chlorite) further betrays their existence. 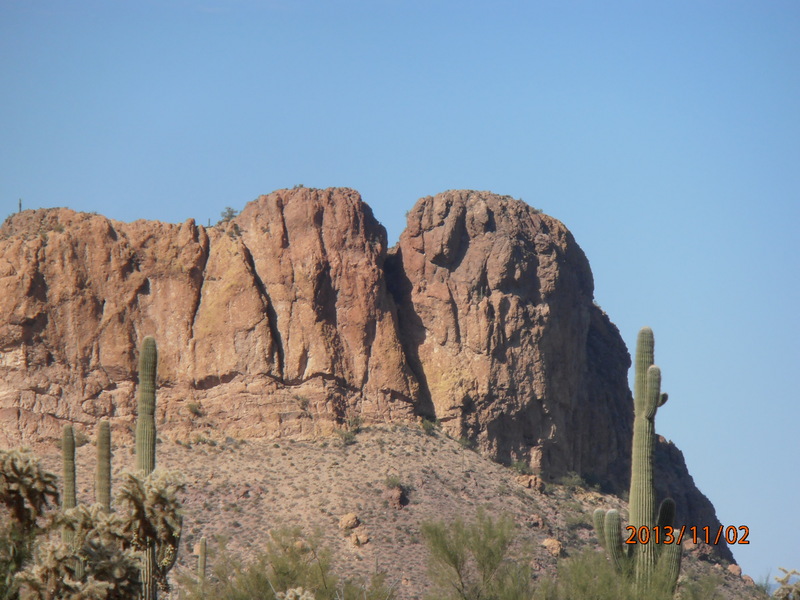 Recently (August, 2018), another tour of the Superstition Mountain Museum was taken, and a thorough examination of the Peralta Stone Maps was made. 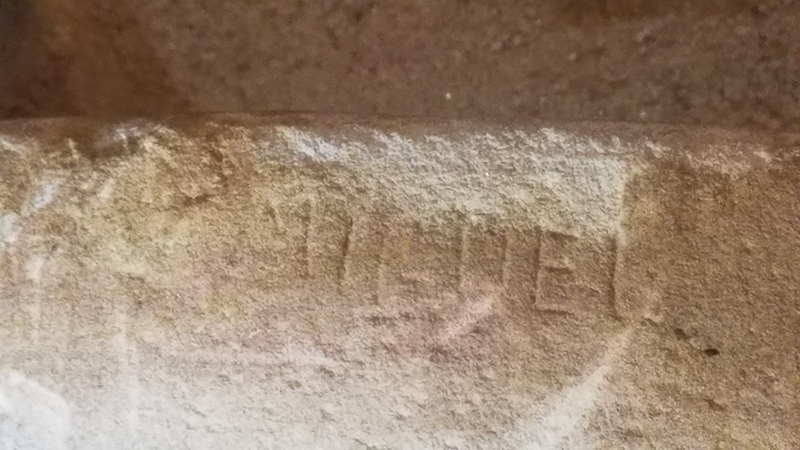 It was noticed that on the top edge of the Horse Stone the name “Miguel” was finely chiseled about 1/2″ high. Note, the Horse stone is much harder than the other 2 and had to be chiseled, not carved. 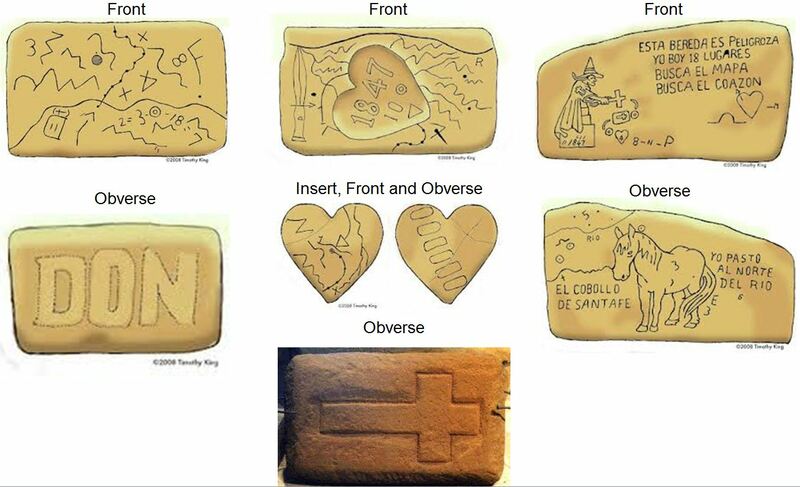 It has been a mystery who created the Stone Maps, and it seems very clear that it was Don Miguel Peralta. Miguel is reported by many sources to be the only survivor or one of two survivors of the 1848 massacre where approximately 400 people were killed. 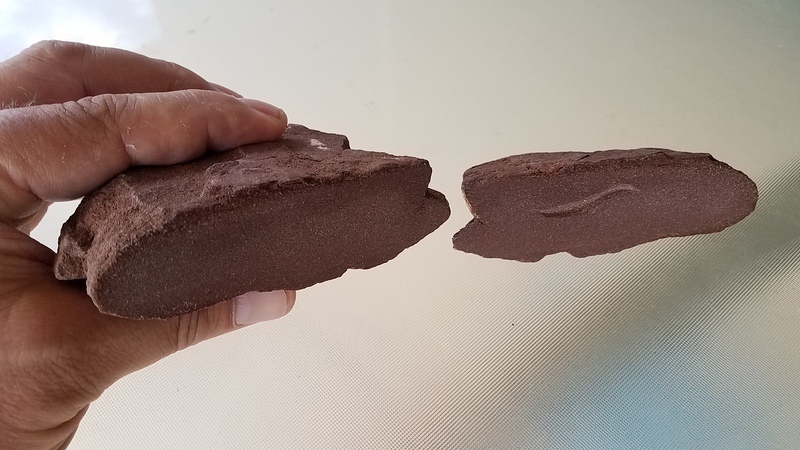 In October, 2018 a large outcrop of rock was found on the Prospect that is called Metalliferous Mudstone. This is a type of exalite of VMS deposits that forms in the close proximity to VMS vents on the ocean floor (see exalite page). A piece of it is shown sawn in the photo above. 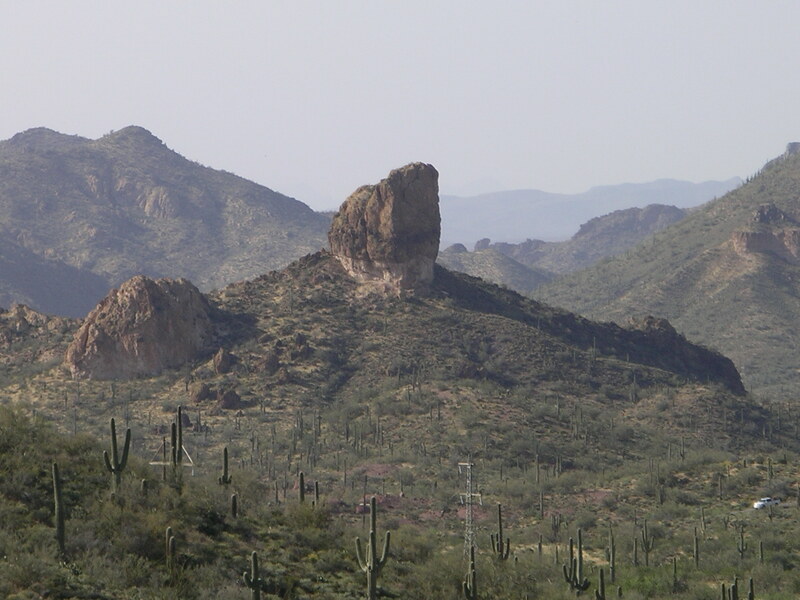 After comparing the rock to the Stones in the Superstition Mountain museum, it is highly likely this is the material that the Trail Stone Map and the Heart Stone are made of. As can be seen in the photo, it is very carveable, and since this was picked off the top of the outcrop, is very weather resistant. 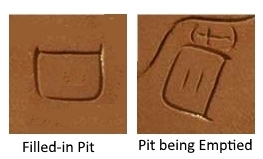 After seeing the 2 Stone maps in question, it can be seen that a very special type of rock was used to make them, because they were carved, not chiseled, with high accuracy, and no chipping on the edges of the carved lines. The Museum was given the 2 rocks shown in the photo. Please see the Seismic Work page for more information about the Peralta Stone Maps.